Depawater and Tricel have joined forces to supply electrical meter boxes in Northern Ireland. With over 40 years’ successful industry experience in the supply of electric meter boxes for residential and commercial use, Tricel is the ideal partner. Tricel’s products are a favorite choice of utility companies throughout both Ireland and the UK and designed for all types of stand-alone, wall or pole mounted scenarios. Industry leaders such as ESB and Bord Gais in Ireland, British Gas, Electricity Northwest, British Gas, British and Southern Energy, Western Power Distribution and the National Grid in the UK all use our highly dependable range. Manufacturing is undertaken at our facilities in both Ireland and the UK, with each unit produced from extremely durable and weather resistant glass reinforced plastic (GRP) and built to the highest local authority industry standards. To comfortably accept the above cabinet, builders should provide an opening of 606mm (h) x 402 (w) x 155 (d). These meter boxes are made from GRP and are compliant to the latest British Standards. Recessed meter boxes are designed to fit inside the wall cavity and provide an excellent recessed installation of electrical meters. 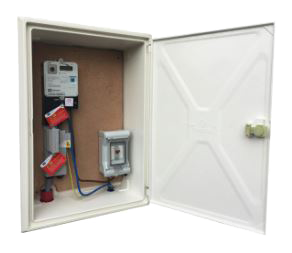 All kinds of domestic electrical meters fit inside this meter box enclosure. For ease of installation, these meter boxes come supplied with fire retardant backboards. These meter boxes do not interrupt any wireless signals associated with wireless meters as they come made from high-quality GRP, not metal. They are also non-conductive and have a high strength to weight ratio. Replacement door suitable for medium Permali recessed meter box, as well as Manweb and Hampton Mouldings meter boxes. Fire retardant to BS 476, Part. 7, 1997, Class 2. 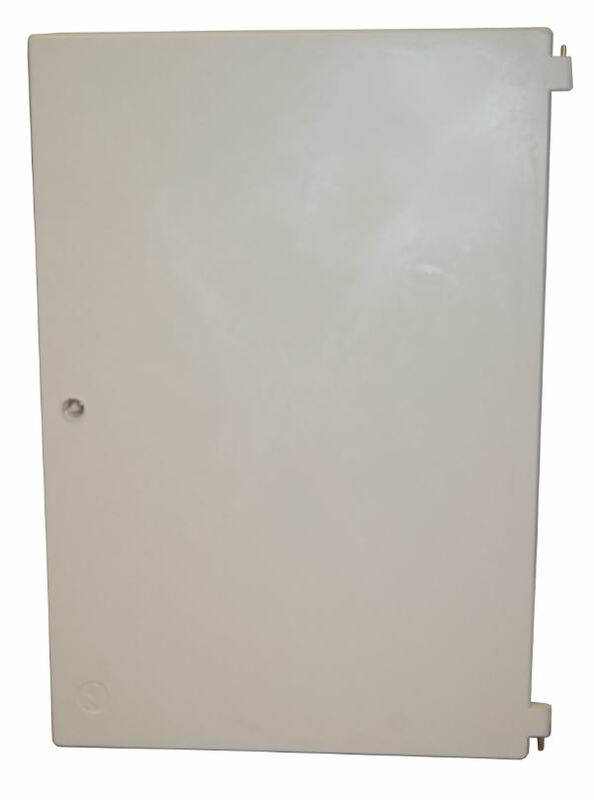 Replacement door suitable for Tricel, Killarney Plastics, ESB electrical meter boxes. 622mm high x 428mm wide.